….what’s in your own backyard. 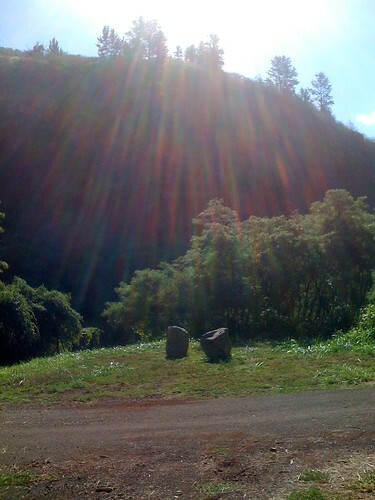 Bruddah Cy brought his truck & his son, and we went 4-wheeling behind the Waikele Self Storage facility. Bruddah Jimmy (friend & neighbor across the street) told me about it a couple of weeks back. We wanted to check out the valley, stream, and bridges that were tucked away deep inside this hidden place. After lying to the security guard and passing the storage facility’s office, we came upon rows and rows of old WWII bunkers. 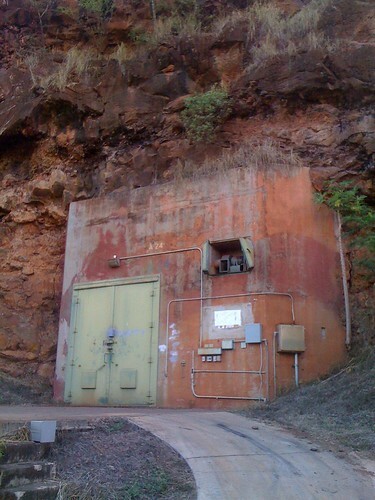 Supposedly, these bunkers once housed missiles and ammo for ships and submarines at Pearl Harbor. They are now used for storage by businesses. After a few more turns, this is what we saw…. ….a beautiful valley with a stream at the floor. The stream was dry in most places, but filled with stones and large lava rocks. There were a couple of stone bridges that crossed over to connect paved roadways. The top of the ridge was protected by a few abandoned guard towers. I had absolutely no idea that all of this was right here in my own backyard. It figures that I would only take a visit during my last few weeks in Waikele. Better late than never….